I think, most of you out there have not ever heard of the place called Saint-Céneri-le-Gérei before. We neither. Not until we read a small piece about it in a last page of a tourist brochure in Alençon, France. 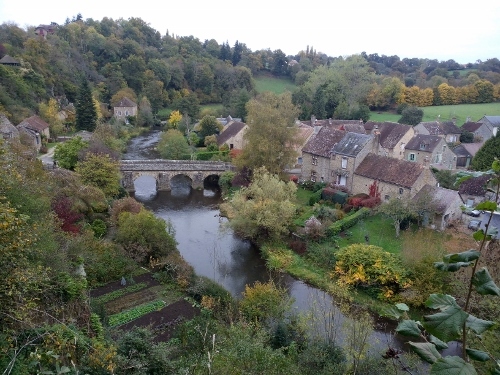 Located on the borders of three departments, Orne, Sarthe and Mayenne and part of “Parc Naturel Regional de Normandie-Maine, Saint-Céneri-le-Gérei, or simply Saint Céneri, is a small village just about 15 kilometers from the town of Alençon. Its location is so unique (between two rivers) that it is dubbed as one of the most beautiful villages in France. We wanted to see for ourselves if it is really that beautiful so after our pilgrimage to Lisieux and Alençon, we decided to drive here. It was quite late when we drove to Saint Ceneri. 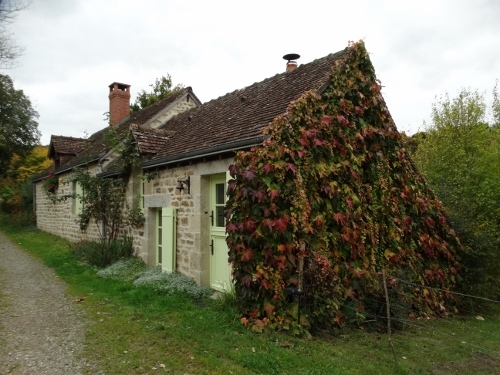 We left Alençon at 17.45 (October 29, 2015), followed the road to Rennes, then Alpes Mancelles. From here, the road became narrow and we found ourselves driving on a quiet inner roads with almost no opposite traffic. I was already wondering if we were heading in the good direction and if our decision to go here was right. After almost half an hour of driving, we finally arrived at the village. Following the signboard for parking, we were quite surprised to find a rather spacious parking area, complete with information boards about the area. There were about 5 other RVs parked there already. 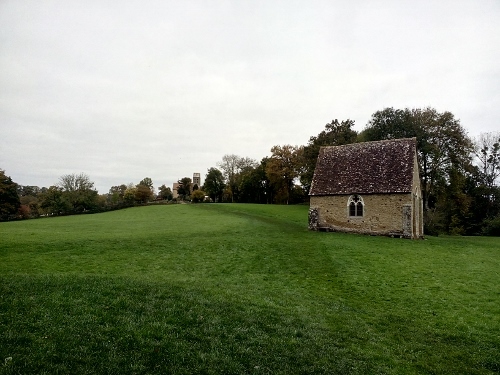 After having settled in, Hans and I did a short walk nearby, and what we have seen so far really impressed us, that we wanted to immediately explore the village. But then, we could still wait one more night….We walked back to our RV. We were consumed with complete silence! It was just 19.00 in the evening, but it looked like the whole village was already sleeping. It was very quiet, only the sounds coming from the nightbirds and some crickets could be heard. We had a very good night sleep that night, waking up the following morning refreshed and eager to explore the village. Saint Céneri is like a big living painting that exudes tranquility. Walking around the village, one can feel its charms : that of a middle-age village as seen from the century-old stone fences found along the streets, the stone houses with facades almost covered with climbing plants with red-orange leaves, cobbled roads, old church and chapel, and a stone-bridge which crosses through river Sarthe and connects the village to the next one. What we miss in the picture are people walking around in traditional costumes or driving around in horse-driven carriages! There is even no bakery or supermarket in the village. The nearest bakery is about 4 kilometers away, in the next village. However, there are about three restaurants/cafe’s which cater to many tourists who visit the place. And its public toilets are quite modern and clean with water, toilet paper and automatic hand dryer. Very different from the old-fashioned toilets we have seen in some of the French villages we have visited. And it is really quiet; except for some cars driving past once in a while, it seems that life begins at past 10 in the morning. 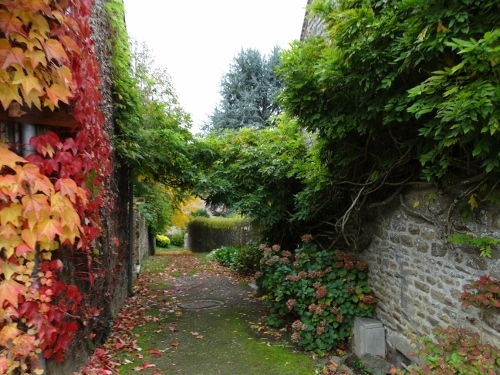 Because of the uniqueness of the place and the beauty of the surroundings, especially in the autumn, the village has also become a favourite place for artists: poets, writers, musicians and painters alike. Here they have obtained that much needed inspiration to paint or compose some poems and sonnets. It was evident by the many impressionist artists who came to this village and painted their most beautiful pieces. A museum, The Moisy Sister’s Inn, is dedicated for these artists. 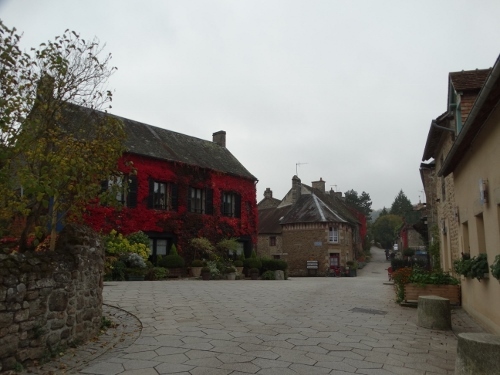 A village with approximately 140 inhabitants and about 30 houses, Saint Ceneri is easy to explore. There are only three major streets and a few small ones. However, we still asked for a walking or hiking map from the tourist office. We began our exploration with a visit to the Church of Saint Ceneri. 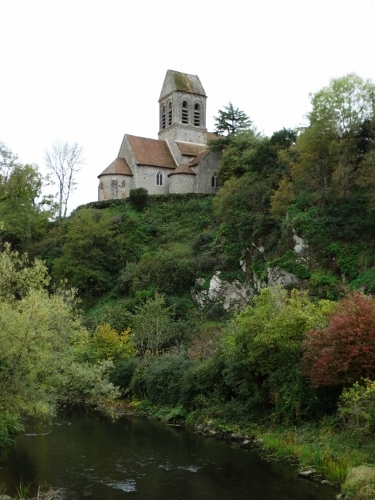 Situated a little uphill from the village center, reached via chemin du eglise, this 11th century old Roman Catholic church is built on a rocky cliff near the Sarthe river. What is especially fascinating about this building are the numerous mural paintings which date as far as 14th and 15th centuries. Also interesting are the small sculptures made of tin depicting the stations of the cross which hang on the right side of the church. At the back side of the church is a viewpoint where one has the picturesque view of the stone bridge and the river Sarthe. On the right side of the church is an old graveyard. 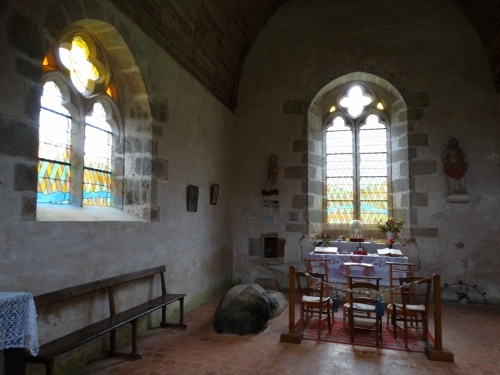 Walking a bit further, we came to an oasis of peace, the Chapelle du Petit Saint Céneri. 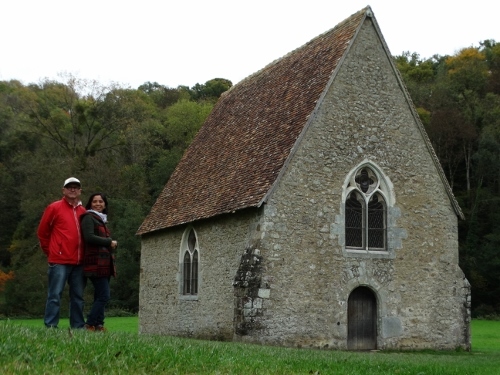 It is a small chapel built in the 14th century on the site where the saint has formerly lived. Its location is perfect, in the middle of the meadow, near the river. The chapel itself is an epitome of simplicity, which makes it a perfect place for quiet reflection, meditation and prayer. 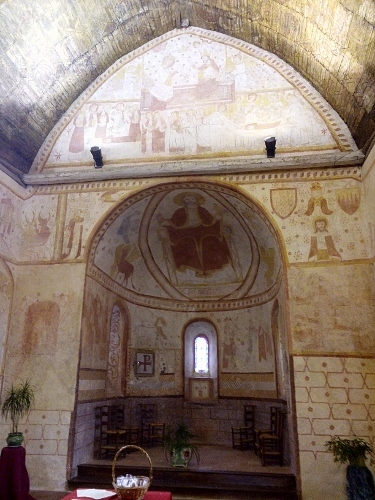 The chapel has been the inspiration of many artists. In fact, at the entrance of the meadow, there is board with an information about some artists who have painted the special spot. Standing here, I for one, also had the urge to get my pencil and paper and do some sketching (not that I possess the talent for that). Walking a little further, we reached the bank of the river, and opposite it is the “miraculous fountain” where Saint Ceneri reportedly had his first miracle. 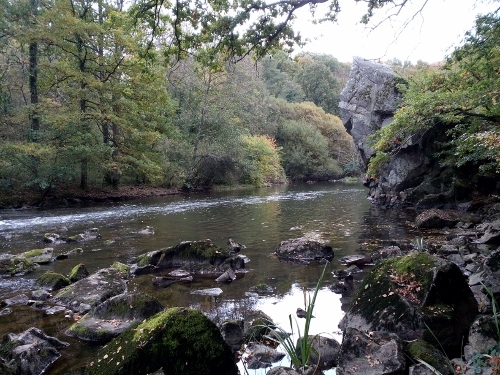 Leaving the chapel, we decided to follow the trail to the Pierre Bécue, or the beak-shaped boulder, which is found along the river. We took the chemin du donjon, then on to the sign for Pierre Bécue. 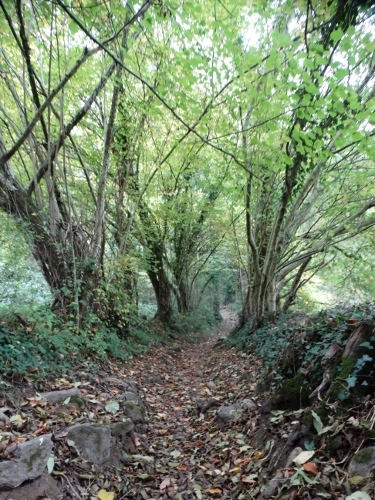 The path was uneven and a bit difficult, with combination of some grassy, stony and rocky paths. This area has also been the favourite spots of the painters. There is a good path, though, which one must not deviate from. Arriving at the place, we saw a big, impressive rock, which on our opinion, does not resemble a beak. Anyway, as it was already late, we decided to go back to the RV and have some rest. After some lunch and needed rest, at 15.30, we continued our exploration. We walked to the stone-bridge. From here we had magnificent view of the church standing proud on top of a cliff. Around the area are also some small art shops and cafe’s. This time, thinking to have a short stroll, we took the gaul’s path via Chemin des Gaulois, which runs partly along the river. Following this path was a big mistake. We kept on walking, following the signs which are the painted marks on trees, not noticing that we were following the wrong trail. Instead of a small hike, we were already doing the big hike. We were distracted by the sceneries around us, the wonderful shades of autumn and the landscapes that we just kept on walking. Too late, after almost 2 hours of walking(sometimes middle in the forest), we did not know where we were. I, having a weakness for map reading, couldn’t understand how we got lost! We were walking along the river, yet we were so far. We saw a gite (a guesthouse) in Moulin le Val, entered it and asked for direction. 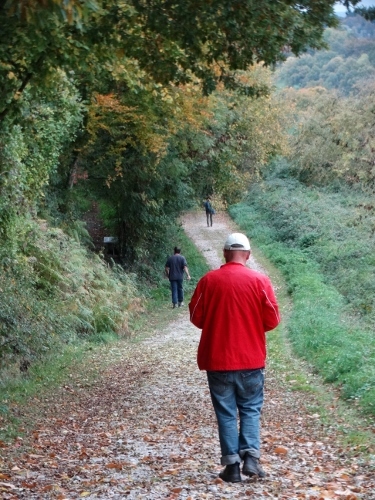 With broken English, the man informed us that it would take a long time before we reached Saint Ceneri, and advised us to take the same route we had. We didn’t like that because it was not good to walk there in the dark. Yes, it was almost 6 pm and it was getting dark! 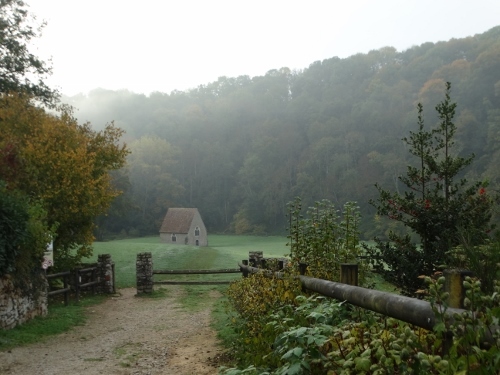 We received another map from him, we walked on, and after one kilometre, we came to Le Gasseau. Here we were very lucky that an old couple offered to drive us back to Saint Ceneri, which was by then almost 4 kilometers away. We readily accepted the offer, thanking them profusely, considering that driving us back had caused them to drive some extra kilometres to where they were going. We have never been so thankful when we got back to the camper. It was a beautiful day, yet too tiring also because of our unplanned hike! We are glad we drove to this countryside village. In so doing, we have seen what for us is the most beautiful village in France, so far. We could have stayed here a little longer, but the weather was not so good, and we had to go further, otherwise, we would not be coming too far. But Saint-Céneri-le-Gérei is one special place that we will always remember and hoping to come back to. Mooi hoor! En wat leuk die fotos zo in een kader.. Hoe doe je dat? Weet je al welke route jullie gaan nemen? Hallo Jeanne En Martin…wij proberen half DEC in Lissabon te zijn..Dan vliegen wij terug naar NL. Tijdens het schrijven, add media. Als De foto in De draft zit, click om the editen..Dan kun je omschrijving doen, De grotte, En margin / kleur. I wonder what the villagers’ source of livelihood in this village is? Hello Gerry..there are few art galleries owned by the locals and others have farms. And I think some go to the nearby town Alençon to work which is just 15 kms away.